May Contain: Mica, Titanium Dioxide (Ci 77891), Iron Oxides (Ci 77491, Ci 77492, Ci 77499), Aluminum Powder (Ci 77000), Manganese Violet (Ci 77742), Ferric Ammonium Ferrocyanide (Ci 77510), Ultramarines (Ci 77007), Blue 1 Lake (Ci 42090), Red 40 Lake (Ci 16035). 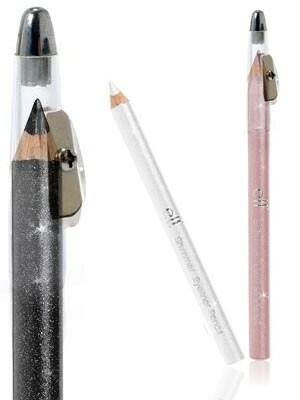 I love these eyeliners and for the price they are really good.I bought a few with a recent order and love the fact that they have a pencil in the lid. they are well pigmented and while at first i was worried about the "shimmer" i have found that its not actually a problem once applied to the waterline. they glide on and don't feel rough on the eye as other eyeliners can. I love these liner they are cheap yet effective. Easy to use, works so well, great dark lines! I think this is a wonderful eye liner, but that is it. It is soft so does not pull on your lids but there was no shimmer at all. Although there was no shimmer, it was still amazing and worth the money I paid!